20 Piece Custom Mini Pastry Sampler in a Cartoon Box for sale. Buy online at Zingerman's Mail Order. Gourmet Gifts. Food Gifts. 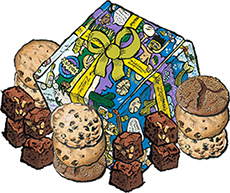 For those who like to choose exactly what they want and don’t wanna share it, now you can select your own assortment of Zingerman’s miniature brownies and cookies. Each pastry is individually wrapped and just big enough to eat in two or three bites. Perfect for desk hoarders and dabblers who want to try it all. Use the menus below to choose the pastries you'd like. Your selection is hand packed to order in our fun, cartooned gift box. Bite-size classic with toasted walnuts. Our bite-size classic but without any nuts.